Ma chanson preferee d’amour est:”one love the u2. My favorite love song is Lucky by Jason Mraz. My husband is active duty military (Army). He was deployed to the middle east a few years ago and it was the first time we had been separated after having been married for a couple of years. I was left with our four children while my best friend and husband was in harms way on a daily basis. The song lucky would always remind me of him and him of me. To this day and probably forever it will be our very favorite song. Whenever this song is played, my husband leans in and sings along to it in my ear. It’s the song he always requested at weddings to dance to, when I used to be able to dance. It evokes smiles, memories, and the assurance that he still notices me and appreciates me and wants me. Moonlight Sonata by Beethoven – its sad but compelling and addictive to listen to. Its a piece of music full of passion without needing any words. Stevie Wonder- For once in my life because it was the first song we played at our wedding. There’s such a lot of world to see”. When I chose it I believed my husband and I would be great adventurers. Twenty Seven years later this has not been the case. Children, mortgage, high school and college tuitions, supporting my mother…no many “got-to-do’s” and no time or money for “want-to-do”s. I wouldn’t change anything but I often wish my “huckleberry friend” and I had had the opportunity to explore! p.s. I adore your books. Thank you for your consideration. Make You Feel My Love (the Adele cover). It’s just beautiful and heartbreaking and…I can’t put it into words. My fav love song is CARRY ME ..by Flintlock . I was 15 years old when I first heard this song ( now 53 ) .. The words meant so much to me back then . With a troubled childhood I dreamt that just someday someone would love me forever . I met my hubby at the age of 19 and we’ve been very happily married for 33 years . Always a woman to me by Billy Joel. I love the words to this song, he describes his love as not perfect but she’s perfect to him. The simple sentences describes so much about her: “She can kill with a smile, she can wound with her eyes”, “she can ruin your faith with her casual lies”, “she only reveals what she wants you to see”, “she can’t be convicted, she’s earned her degree” – that line in particular makes me laugh. This woman is human and she doesn’t always get it right but he knows her so well and accepts her flaws and all. It so special to me that I played it at my mother’s funeral. She wasn’t perfect to a lot of people but she was to me and I will always associate her with this song. Lone Star was my favourite book of all time. I would adore a signed copy so much. My favourite love song is Stand by Me by Ben E King. On my 21st birthday (27 years ago) my boyfriend at the time, Shaun, played the guitar and sang it to me. Just the two of us in a room after a few drinks. 1 year later he died. It is such a special song to me. Shaun had a lot of Johnny in him. A ratbag with a heart of gold who is capable of such love but such mischief. I think this is why the book moved me so much. I tried to send to the above email address but it wouldn’t send. I hope I still have a chance to win. Apart from the obvious that Mariah has such a beautiful, strong and powerful voice…. This song I feel close to my heart with the feelings of feeling alone, having to be strong through the hard times and knowing that I have and will succeed in life. 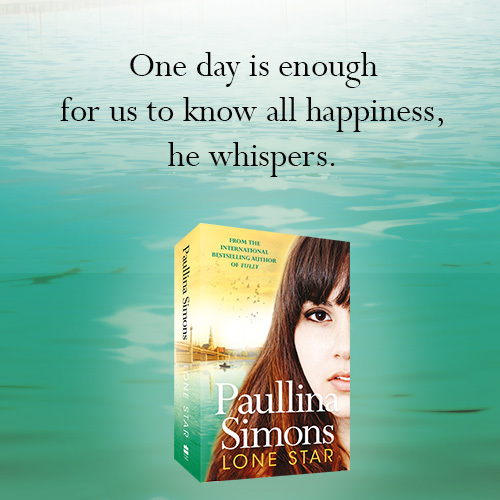 I am a huge Paullina Simons fan. Been waiting on this book forever. Would love to read it. Thanks so much.for the chance to win. My favorite love song is Have I Told You How Much I Love You-Rod Stewart. It was mine and my husband’s song. It means even more to me since his death in 2008. Melancholy. It would be a toss up between, He Stopped Loving Her, By George Jones, The Dance, By Garth Brooks and Anne Murray’s Could I Have This Dance. These songs remind me of my first love, my lost love, and my present love. My favorite love song is Faithfully by Journey. It reminds me of summer days sitting on my porch when I was totally lovesick for my boyfriend who’s now my husband. My favorite love song is ‘Never Stop’ (Wedding Version) by Safetysuit. I love this song so much because it puts into words the emotions that every woman wants to hear from the man she loves. It’s raw, honest, and heart-felt; pure perfection if you ask me. I haven’t found my forever love yet, but when I do, I hope he’s familiar with this song. And if he isn’t, I will make him. Thanks for the opportunity, Paullina! My absolute favorite song is, Wonderful Tonight by Eric Clapton. This is very sentimental song to me. It was my husbands and I’s wedding song. It was the song that spoke to me when we were slowly/fastly falling in love. This will be our song til the end of our days. But also, the mellow crooning of Mr. Clapton is beautiful. Pink – “just give me a reason”. I love this song as most couples have a rough patch and are just bent, nor broken. I would love to have a copy…thanks for the opportunity! Because it evokes my youth and my first love. Its lyrics is very deep and, as all of us know, Freddie Mercury was dying when he wrote and interpreted thar song. It’s wonderful! My favorite love song is “All the Way” by Frank Sinatra. It truly tells the story of an everlasting love that you must be in all the way for it to survive. This song was sung in the movie starring Frank Sinatra called “The Joker is Wild” which was a sad love story. I was only 9 years old when this came out but I remember it from my parents watching his movies. Love this song, always my favorite. Depends on where i am at that moment in my life. I think this song say it all. “Never Let Me Go” by Florence and the Machine is by far my favorite, most heartfelt love song. It goes beyond the words. To truly feel a song I believe the voice has to capture you. Much like writing an essay or a poem, the words are what you understand, but the person telling you the story is the one capturing your emotions. “Never Let Me Go” was the first song I had heard from Florence and the Machine and the voice of Florence Welch stopped me in my tracks. I looked at my fiancé and told him before I die I need to witness her magic in person. He said “one day you will.” I haven’t yet, but I still worship her music daily. The song still gives me goosebumps and I already have it listed to be played at my wedding (three months away.) It’s just one of those songs that never grows old and can steal your breathe with the first word. My sister shares my love for Florence and the Machine and, as strange as it is, my 7 month old son will only take naps when “Never Let Me Go” is playing. Like I said, magic. “I Know I’ll Never Find Another You” by The Seekers. I see in the lyrics, two people finding each other and becoming soul-mates in every sense of the word. And, they really dont need a lot of people around them because they enjoy being with each other through thick and thin. And, being together doesnt mean glued to each other; they have personal time but with the knowledge that special someone is always waiting for them. For me, my someone was David in Texas and Im in Missouri. So, on my birthday 6 years ago yesterday, David died unexpectedly. I was shattered. A couple days later as I was backing out of my garage, this song came on the radio and I bashed the side mirror on my car, pulled back in, backed out, bashed it again. Our song always makes me teary. David still holds my hand. My favorite love song is Angel Eyes by The Jeff Healy Band. My fiancé sang this song to me the night he told me he loved me the first time. Unfortunately, he passed away a month before our wedding. That was 13 years ago. I am 45 and still single. I haven’t met anyone like him and can’t settle for less. Because it reminds me of simpler…more happy times. I have SO many favorite songs, but the first one that came to mind is the Beatles’ YESTERDAY–such a beautifully, simple song. Maybe I’m Amazed. Love the love Paul and Linda had. Moondance by van Morrison. Hubby (of 20 years) and i danced to that the afternoon we got engaged! I have a few different ones for different people. I have a song that’s in Spanish called Los Caminos De la Vida artist Vincentico. My daughter used to sing it to my father in law when she was only 6 and now that he has passed it means even more when I hear it. Also Fools Rush In by UB40 that was my wedding song and it brings a smile to my face, if that song comes on and hubby and I are in the same room we automatically lean in and kiss. 22 years later and its always the same. Thank you for this chance. I love your books TBH is and forever will be my favourite book. Thank you again xxxx Adriana. My favorite love is Storybook Story by Mark Knopfler. It might be better known as the Princess Bride theme. I just think the story of the song is beautiful. It talks about how his love is like a storybook story, and we all know that the romance in stories is a romance we all dream about and want in our lives. Definitely worth a listen if you’ve never heard. If I ever get married, I want to walk down the aisle to the guitar music from it. Don’t want to miss a thing by Aerosmith I had this as my first dance wedding song. It says everything that I feel about my husband better than I can. I can’t listen to this song without tearing up it instantly brings back happy memories. Since I first heard it as a young girl in the movie (Robin Hood, Prince of thieves) it gave me goosebumps and started dreaming of my Prince Charming . Even now married with a 4 year old & another on the way I get the same goosebumps. It’s a song of pure emotion and love! WooHoo! I’m so looking forward to reading this, contest or not (though I definitely just submitted mine). haha. “In My Life” by The Beatles. This song describes past loves, and how they will never be forgotten, but how in this life, the person he’s singing to is the absolute love of his life. My husband and I danced to this song at our wedding…it seemed fitting and is just so sweet. This is a beautiful old song which is reminiscent of love stories at time of war. Why? Because it takes me back to a time when I first met my soulmate. However this song also pains me, because of timing and circumstance me and my great love do not end up together. We are still friends and keep in touch but we both lead different lives. I will always love him and this song says it all. I still hold out, hoping one day we may be reunited even if for a moment. I vitally like lonestars Amazed’ or Kenny Rodgers singing Lady. Falling In Love by Chris Isaac because it’s so sensual, beautiful and meaningful. My favorite love song is “Endless Love” because true love is always endless. Even when two people are separated they still carry pieces of each other for the rest of their lives. You’ve Lost That Lovin’ Feelin’” – The Righteous Brothers. I love this song because it entails the sadness and emotion of the person who is still in love and recognises that the woman that he loves no longer recipricates it. He lives in hope that “something beautiful is dying” may come back to him. It also reminds me of that great movie Top Gun when we all as teenage girls were in love with Tom Cruise as he serenaded Kelly McGillis! My favorite love song is “Eternal Flame” by The Bangles. The vocals and arrangement are fabulous, but it’s the lyrics that make such a deep connection with me. The reference to a life so lonely until you came and ease the pain is the one true love kind of experience most people long for, whether they know it or not. You, of course, know it well — the Alexander and Tatiana kind of love. So many to choose from that it seems impossible to pick just one! I’d have to say Bob Dylan’s “Make You Feel My Love.” The lyrics are are so beautiful yet simple and convey so much yearning. It gets me every time. “Waiting for a Girl Like You” by Foreigner. It was big in the early 80s when my husband and I first started dating. Now we have been married almost 31 years! Billy Currington – Must be doing something right. This song sums up exactly what I believe all passionate romances should be, what all men should be singing to the lady they love and adore. Not only that but his voice simply melts my soul! My favorite love song is Alan Jackson’s remember when because its honest and real. My song is Feels like Home by Chantal Kreviazuk. As someone whom travels and spends time away from his family for work, with a long amount of time unable to communicate to my family and friends. I first heard this song on the radio as I was leaving for three months and I had tears within seconds….and I had a strong connection straight away to this artist. The feeling of hearing this song gives a warm feeling to myself whenever I feel alone and miss my children. thank you for the chance to win one of your books.. I really really love your books.. I love the melody. It gives me chills every time. Plus their live version from The Electric Factory includes a smash of You Are So Beautiful and wow, it’s amazing! My favourite love song is La Vie En Rose by Edith Piaf. I love it because even though it literally means “life in pink” , it means that when you are in love, you see everything positively. And I love that love can do that.